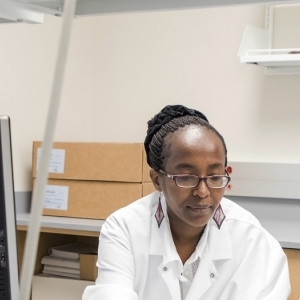 Dr. Margaret Ndinguri (Chemistry) in collaboration with Dr. Lindsay Calderon (Biology) have received a patent from the United States Patent Office for a chemical compound that selectively targets cancer cells. Read more here. The newly formed EKU College of Science has prepared the following video to highlight the different departments and resources available to students. A project under the direction of Dr. Donghui Quan was recently published in The Astrophysical Journal. The isomers of ethanimine (CH3CHNH) were recently detected toward the star-forming region Sagittarius (Sgr) B2(N) using the Green Bank Telescope PRIMOS cm-wave spectral data, and imaged by the Australia Telescope Compact Array. 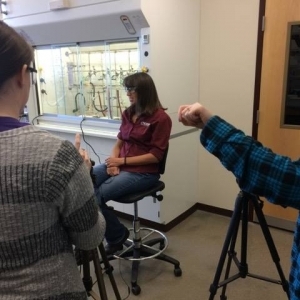 The EKU Department of Chemistry has started to develop a video series about the research opportunities done in the laboratories of various faculty members. Learn more about the research done in Dr. Judy Jenkin's lab in the EKU Chemistry Department. These opportunities are available to students at the undergraduate and graduate level.